As you know, recently the Rural Postal Service had strike for about 10 days and after the assurances received from the government, more than 3 lakh postmen had withdrawn the strike. So in the Cabinet meeting on Wednesday, the increase in the salary of the part-time employees associated with the postal department has been increased to 56 percent according to the seventh pay scale. That is, the proposal to increase salary and allowances of the postal workers has been approved. Arrivals will be provided to the Postal Servants from January 1, 2016. 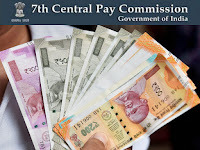 Let us tell you that in a release issued by the Ministry of Information & Broadcasting, it has been said that the Union Cabinet has approved the amendment in the salary allowances of the rural Postal servants (GDS) of the Department of Posts under the chairmanship of Prime Minister Narendra Modi. In order to amend the salary allowances, during the year 2018-19 1257.75 crores (non recurring expenditure of Rs. 860.95 crores recurring expenditure of Rs. 396.80 crores) is estimated. This amendment to salary allowances will benefit 3.07 lakh rural post offices. 1-time regular allowance (TRCA) structure and slab has been made compatible. Total GDS has been brought under these two categories - Branch Post Master (BPM) and Assistant Branch Post Master (ABPM) like Branch Poster. 2-Existing 11 TRCA slabs have been brought under only three slabs, which have one level for BPM and other BPM personnel. 3-Dearness Allowance will continue to be paid separately and for the Central employees, it will continue to be changed from time to time. 4- Under the new scheme, it has been decided to continue the grace bonus with the calculation of TRCA + DA to the extent of 7000 rupees.